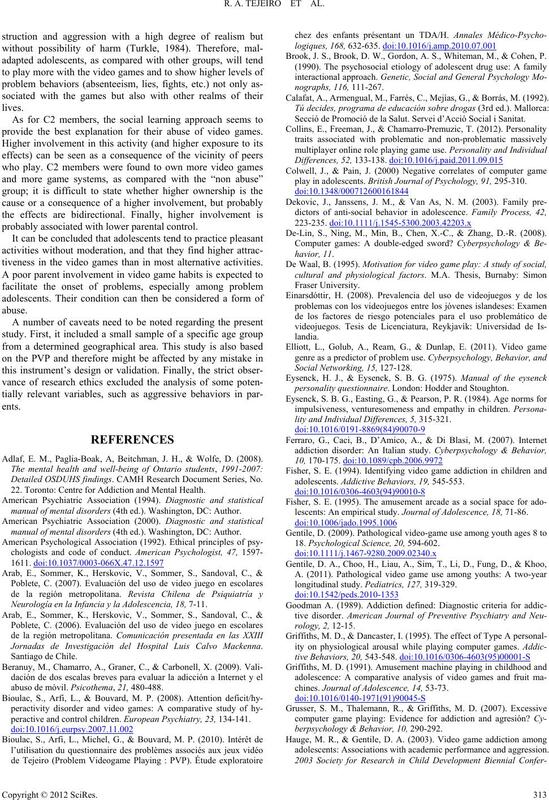 of diagnostic or screening studies on video game “addiction”. video game players, as shown in Table 1. 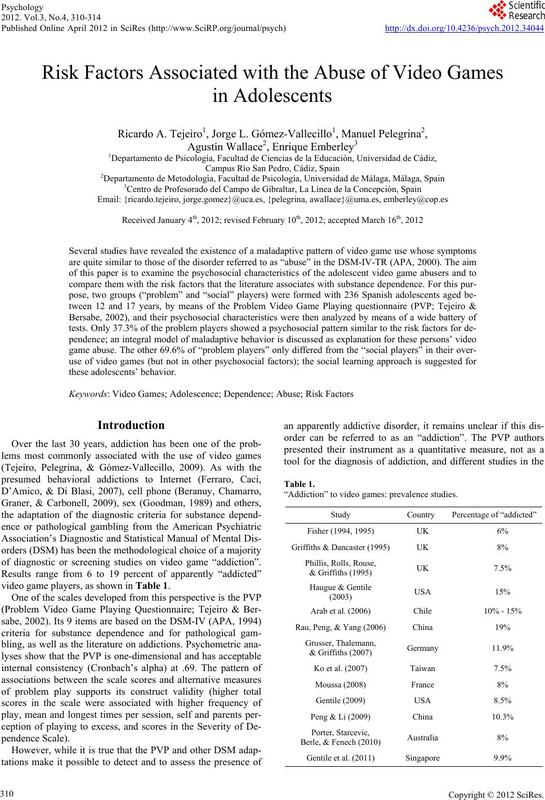 “Addiction” to video games: prevalence studies. R. A. TEJEIRO ET AL. respondents answered affirmatively 2 or more items. tualized as an example of abuse. Farres, Mejias, & Borras, 1992). (SD = 1.12). Forty-eight percent of respondents were female. 15.0 (SPSS, Chicago, IL, USA). during the previous year but scored less than 4 in the PVP. completed the rest of the aforementioned questionnaires. C1; and C3, formed by the 118 social players. other variables. Results are resumed in Table 2. Mean scores and statistical significance. lower satisfaction with their city and neighborhood. them about this activity and they prefer and practice shared play. sports, platforms and adventures are their favorite types of play. and they tend to play at home or in the homes of friends. peer relations, and school grades. number of problem behaviors associated with this activity. Therefore, our hypothesis was only confirmed for C1 members. trol their children’s use of games (Colwell & Pain, 2000). provide the best explanation for their abuse of video games. probably associated with lower parental control. 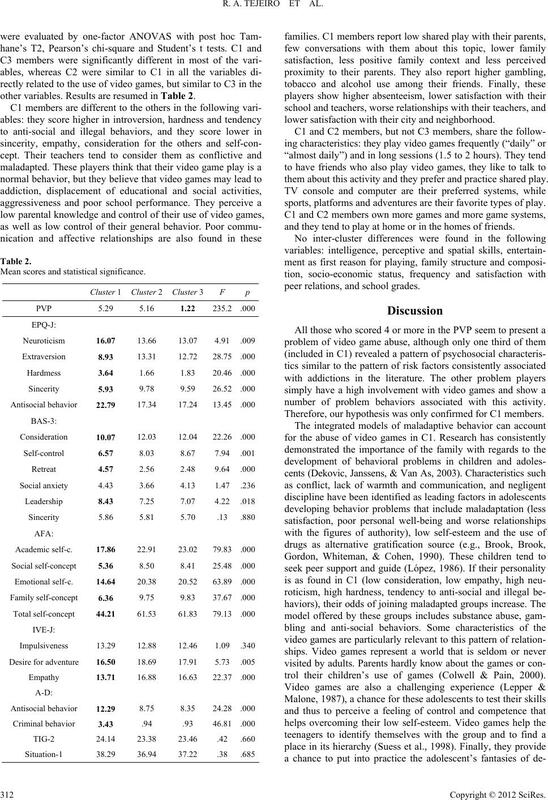 tiveness in the video games than in most alternative activities. Adlaf, E. M., Paglia-Boak, A, Beitchman, J. H., & Wolfe, D. (2008). Detailed OSDUHS findings. CAMH Research Document Series, No. 22. Toronto: Centre for Addi cti on a nd Mental Health. manual of mental disorders (4th ed.). Washington, DC: Author. Neurología en la Infancia y la Ad ole sce nci a, 18, 7-11. Jornadas de Investigación del Hospital Luis Calvo Mackenna. abuso de móvil. Psicothema, 21, 480-488.
peractive and control children. European Psychiatry, 23 , 134-141. Brook, J. S., Brook, D. W., Gordon, A. S., Whiteman, M., & Cohen, P.
Calafat, A., Armengual, M., Farrés, C., Mejías, G., & B orr ás, M. (1992). Secció de Promoció de la Salut. Servei d’Acció Social i Sanitat. play in adolescents. British Journal of Psychology, 91, 295-310. De-Lin, S., Ning, M., Min, B., Chen, X.-C., & Zhang, D.-R. (2008). personality questionn a ir e . London: Hodder and Stoughton. 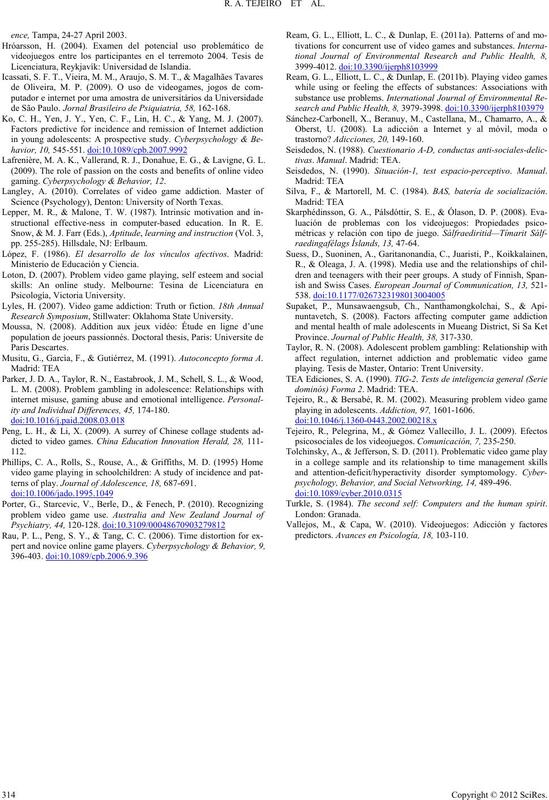 lity and Individual Differences, 5, 315-321.
adolescents. Addicti v e Behaviors, 19, 545-553.
lescents: An empirical study. Journal of Adolescence, 18, 71-86. 18. Psychological Sci ence, 20, 594-602.
longitudinal study. Pediatrics, 127, 319-329.
chines. Journal of Adolescence, 14 , 53-73.
berpsychology & Behavior, 10, 290-292.
adolescents: Associations with academic performance and aggression. ence, Tampa, 24-27 April 2003. Licenciatura, Reykjavík: Universidad de Islandia . de São Paulo.Jornal Brasil eir o d e Psiquiatria, 58, 162- 168. Ko, C. H., Yen, J. Y., Yen, C. F., Lin, H. C., & Yang, M. J. (2007). Lafrenière, M. A. K., Vallerand, R. J., Donahue, E. G., & Lavigne, G. L.
gaming. Cyberpsychology & Behavior, 12. Science (Psychology), Denton: University of North Texas. structional effective-ness in computer-based education. In R. E.
pp. 255-285). Hillsdale, NJ: Erlbaum. Ministerio de Educación y Cien cia. Research Symposium, Stillwater: Oklahoma State University. Musitu, G., García, F., & Gutiérrez, M. (1991). Autoconcepto forma A.
ity and Individual Differences, 45, 174-180.
terns of play. Journal of Adoles cen ce , 18, 687-691. Seisdedos, N. (1990). Situación-1, test espacio-perceptivo. Manual. Silva, F., & Martorell, M. C. (1984). BAS, batería de socialización. Province. Journal of Public Health, 38, 317-330.
playing. Tesis de Master, Ontario: Trent University. dominós) Forma 2. Madrid: TEA. playing in adolescents. Addiction, 97, 1601-1606.
psicosociales de los videojuegos. Comunicación, 7, 235-250.
psychology, Behavior, and Social Networking, 14, 489-496. Turkle, S. (1984). The second self: Computers and the human spirit. predictors. A vances en Psicología, 18, 103-110.